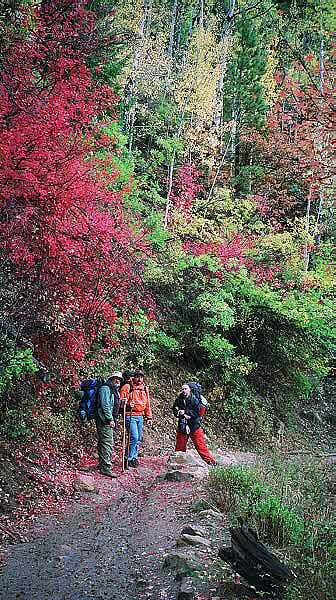 It is October 4; the Aspens and Cottonwood trees are in full color. The trail here is flat and dry, but soon becomes steeper and quite muddy from last night's rain. We work to get used to our packs (I fell over in slow motion into a tree by turning to talk to the guys); it takes a couple of miles, then it's as if the packs were part of us. Everyone talks about the trip up, but going down, one has to work just as hard to "not go down" while going down. 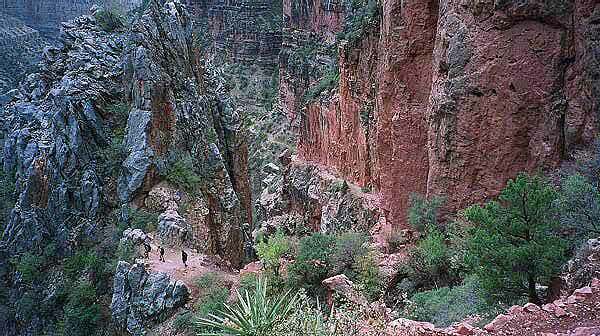 The upper part of the North Kaibab trail (as does all of the Bright Angel trail on the other side) has a lot of mule traffic. So... In addition to the mud, we had a dandy 'ole time avoiding both mule droppings and mule puddles. Not that watching one's step is that difficult, but it's hard keeping your attention at your feet with such views around. As the way gets steeper, we pass a group preparing to take a break. So far, the heights and narrow areas have not bothered me at all. One can see off to the right, the trail continuing down is fairly narrow with a dropoff that could certainly be hazardous. My only surprise is that as one navigates inside the Grand Canyon, your views are generally limited to whichever side canyon you happen to be in. Later on, we will have views of the North and South Rims, but never together. 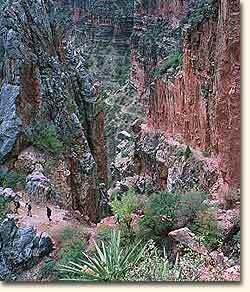 Being in the Canyon is not like being in a big valley with the rims on both sides. 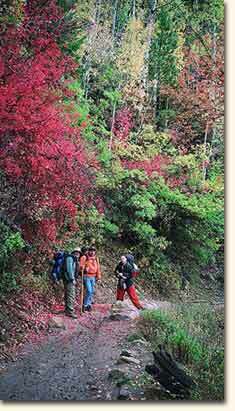 Our goal for today is Cottonwood campground (el. 4000), for a total of about 7 miles into the Canyon. 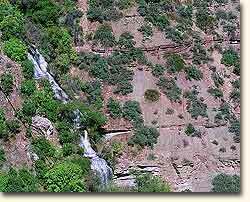 At about the 2 1/2 mile mark, just a little farther down the Canyon, we hear the sound of Roaring Springs. 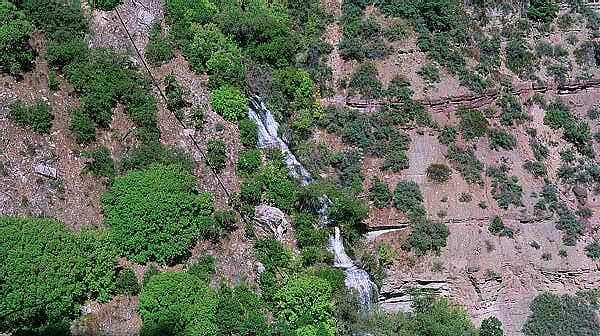 Gushing out of the middle of a vertical cliff, Roaring Springs can be heard for 1/2 mile away. The water comes from underground aquifers in the limestone layer above, the top level of both rims. 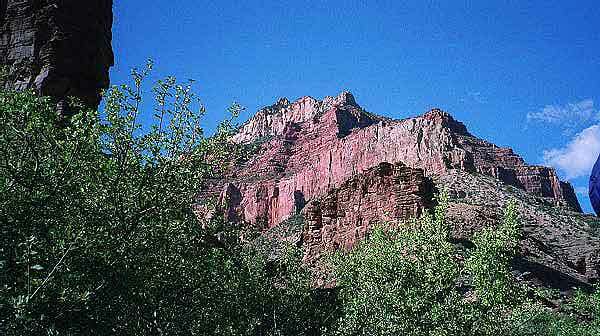 Roaring Springs is the water source from this point all the way across the Canyon and up to the South Rim. 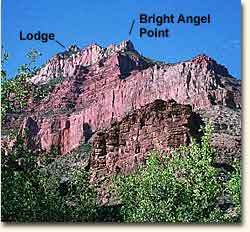 It is gravity fed to within 1000 ft. of the South Rim (el. 6800) where it is then pumped to the top. Roaring Springs flows into Bright Angel Creek, which we will follow for almost half our trip, until it flows into the Colorado. From our first Campsite, Cottonwood, we have a beautiful view of the North Rim where we came from, 4200 feet above us. It's early October and it gets dark between 6-6:30. If it weren't for the lights at the Lodge, it would be impossible to tell where it was. Tomorrow, we head for the bottom.